Yesterday we held the annual birthday party for Leon and everybody was there except Tiffiny. We didn’t know what to do as the weather can be so cranky sometimes. 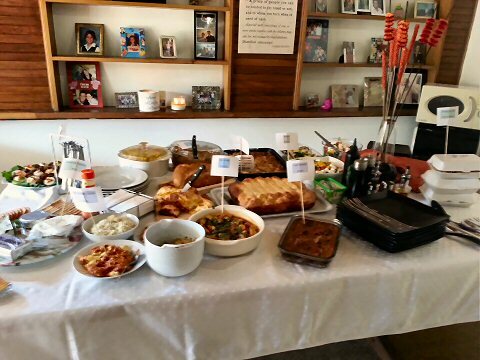 So we decided to keep it home and do a buffet with everybody contributing. Robby baked some breads (Bianca’s recipe). Vince brought some Thai Chicken Strips (as a young bachelor I think I know where he purchased that). Amy did a chocolate cake with a candle and a lemon tart. Tracey and Martin brought a Malva Pudding – my favourite. Ryno and Pria supplied the Chinese Noodles for the hungry. Paul and Lucia made sure the chocoholics were catered for with a choc-marshmallow dessert. Tony and Judy waved the Italian flag with a pasta and there wasn’t much left in the dish. Felicity cooked some Moroccan that was as tasty as you can get. And Andre and Bernie made my favourite Baklava – I’m going to have to gym for a month just to get rid of all the calories guys. As always it was a noisy and busy afternoon and everybody talked to everybody – just the way it should be. We missed Tiffiny a lot though. I’m thanking the Universe for blessing me with a crazy family that can still hold a birthday party to remember, and the only things that gets hurt is the overflowing rubbish bin – I counted 40 bottles (ok, some were beer bottles). I wonder why my body is stiff today? Posted on August 26th, 2013 under Family. Tags: Memories, Party. RSS 2.0 feed. Both comments and pings are currently closed.